Sunday, 13 August 2017 – At 191.3 kilometres, the 7th stage of the BinckBank Tour travels from Essen to a finish halfway up the Wall of Geraardsbergen. The closing circuit of 25.6 kilometres takes in four climbs, including the infamous Wall from bottom to top. After the Wall of Geraardsbergen was removed from the Tour of Flanders in 2012 the Eneco Tour adopted the climb. Since then Alessandro Ballan, Zdeněk Štybar, Greg Van Avermaet, Manuel Quinziato and Edvald Boasson-Hagen powered to victory on the steep cobbles. The BinckBank Tour honours the tradition with exactly the same finish on the Vesten, which is halfway up the Wall. 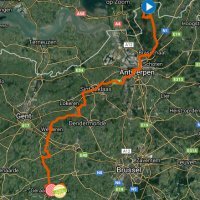 The closing stage of the BinckBank Tour starts in Essen, near the Dutch border, and after a local round the riders travel to Antwerp. The route then takes in a section of the last Tour of Flanders and at kilometre 133.5 the Wall of Geraardsbergen appears for the first time. The cobbled climb totals 1.1 kilometres at 7.6%, while the steepest stretch is 20%. At kilometre 138.8 the riders get a first taste of the finish line before the race concludes with two local rounds of 26.4 kilometres. Each run takes in climbs up the Wall, Bosberg (1.1 kilometre at 6.2%), Onkerzelestraat (1.5 kilometre at 3.8%) and Denderoordstraat (700 metre at 7.6%). After the last passage on the Denderooststraat there are 5.4 kilometres left to race. The first section is flat before a gradual descent of 2 kilometres leads to a flat 1.5 kilometres run-in to the foot of the Wall of Geraardsbergen. The last 500 metres go up at 5%. Niki Terpstra won the last Eneco Tour. Who is going to succeed him by winning the first BinckBank Tour? The Golden Kilometre begins at kilometre 170.5, giving riders the opportunity take to three time bonuses of 3, 2 and 1 seconds each within 1 kilometre. The first three riders on the line win 10, 6 and 4 seconds. Read also: results/race report 7th stage 2017 BinckBank Tour.